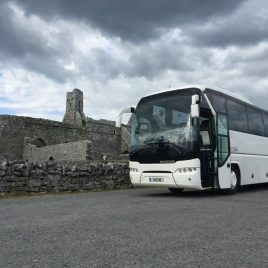 The Galway Tour Company is Galway’s leading Day Tour Company offering Day & Night tours of popular destinations and lesser taken routes including the Cliffs of Moher, the Aran Islands, Connemara & Clonmacnoise Monastic City. Established in the Spring of ’07 the Galway Tour Company have one simple goal and that is for you to enjoy and experience what we have and what we enjoy. Entering Connemara on the Lough Nafooey route allows you to see the stark beauty of the hidden valley of Connemara before arriving at the Atlantic Ocean and for hostellers there is an option to hop-off at Sleepzone Connemara. The tour then continues to Kylemore Abbey where we break for lunch and sightseeing for 1 hr 45 mins. Entrance into Kylemore Abbey & Gardens is not included in the tour price and is an optional fee. Leaving Kylemore late afternoon we driver through the Inagh Valley, Maam Cross & Oughterard and complete the circuit of Lough Corrib before arriving home to Galway City. A truly magical day out in typical Irish countryside- let us bring it to life and inform you of the many legends!